A few years back--and long before online bead shops--my tall, handsome boy friend (let's call him Mr. 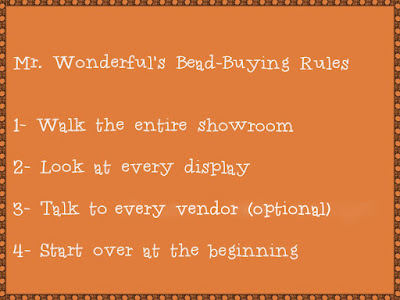 Wonderful) used to take me to traveling bead shows. Bead and findings vendors from across the country would fill a suburban convention center showroom with table after table of strung beads, silver chains, stones, cabochons, and more. You know, like a bead shop only much, much bigger. My heart would begin racing as we exited the car and crossed the parking lot. We'd stroll into the showroom and Mr. Wonderful would smile and say, "Get whatever you want, baby." That smooth declaration always set my bead addiction on fast forward. Nothing feeds a bead habit like holding a shiny strand in your hot little hand. I'd fondle strands of hematite, amethyst, turquoise, and garnet. I'd go crazy over unique stones, sun-polished wooden beads, and freeform labradorite cabs. Bead shows made me giddy. 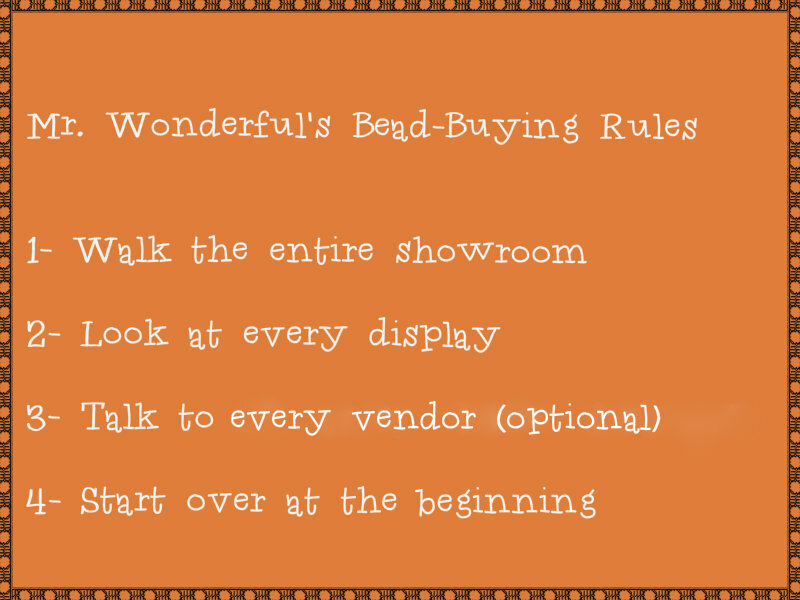 Imagine the thrill of walking into a room full of beads, knowing you can have whatever you want and you don't have to pay for it. Of course, before I could feed my bead addiction, I had to comply with a few rules. During the second showroom walkabout, Mr. Wonderful set me free to buy my beads. He would follow along behind me like a sweet puppy dog. He'd watch over me and smile like an overgrown kid. (My bead frenzies were crazy-entertaining to watch.) After I made my decisions, he'd pay for every single bead. I know it sounds petty, but because of those bead-buying trips (and perhaps those kill-me-now good looks), I stayed with Mr. Wonderful far longer than I should have. He was, indeed, my handsome, generous bead godfather; but alas, Mr. Wonderful was also straight-up OCD. After we'd leave all the bead show magic behind, his drive to keep my beads neat and tidy and all lined up nice and straight made it all a bit too serious for me. Eventually, it wore me down. I'm much more reasonable about beads now. I haven't been to a bead show in years. I no longer feel anxious and excited when I enter a bead shop. And online bead stores never did give me that same exciting hands-on thrill. I don't feel compelled to make jewelry all night just because I bought new beads. I control my bead cravings and I can give them up whenever I want. I really can give up beads when I want to. That's mostly because I transitioned away from the costly, heavily beaded jewelry projects I made when I first started selling jewelry all those years ago. 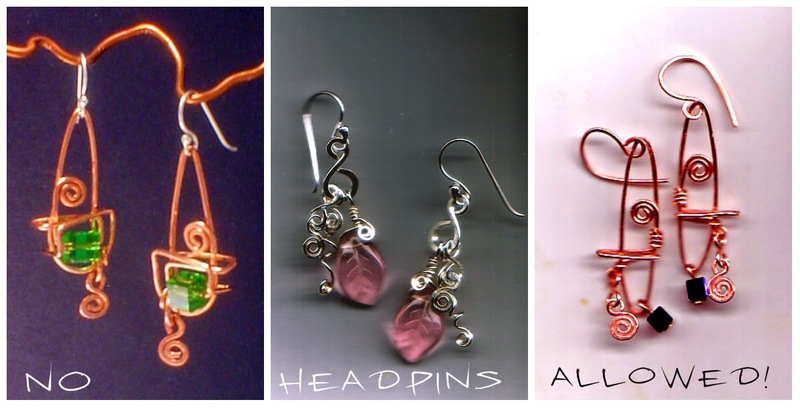 I began focusing on wirework and metalwork long before it became the trendy thing to do. 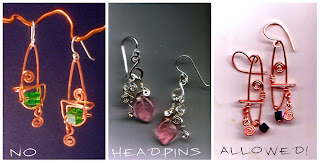 I still use beads, but I rarely use a full strand in a single piece. 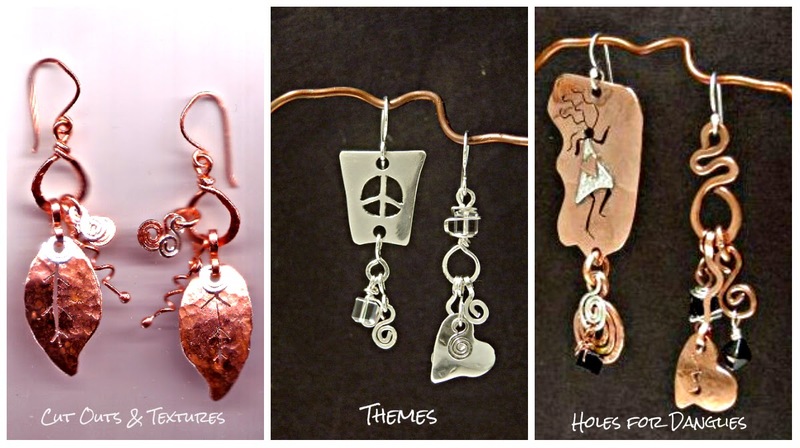 In my jewelry creations, wire, metal, and beads are equals, coexisting in peace. I will always love beads. They are pretty, colorful works of art I could never do without. Fortunately, just like with Mr. Wonderful, I've learned not to let them rule my creative life.